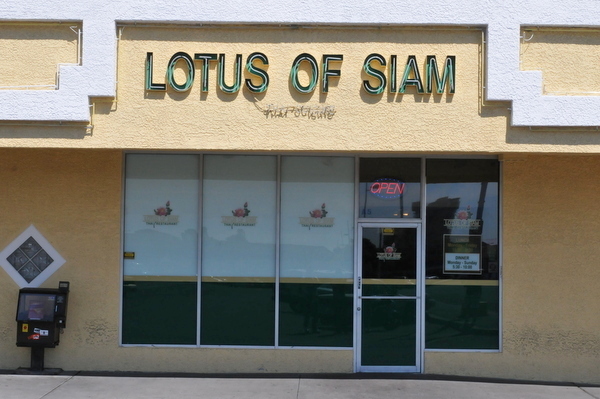 Though you couldn't tell by looking at it, Jonathan Gold proclaimed Lotus of Siam the "single best Thai restaurant in North America" back in August of 2000. Lotus of Siam has been on my radar for a while, I never could spare a dinner so this time I drove up early so I could make it in time for lunch. 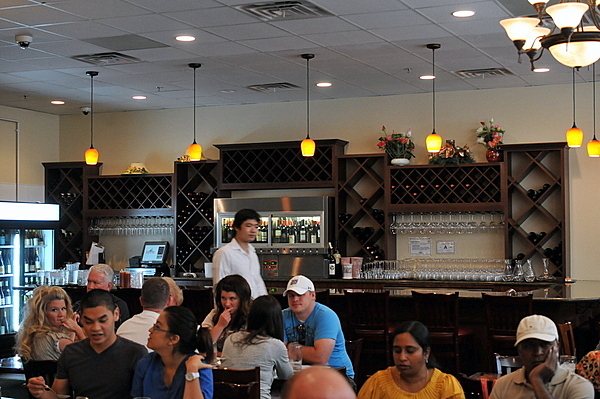 As reader Charlie Fu pointed out, Lotus of Siam has an extensive wine list with some high end bottles priced well below current retail. For those who don't mind splurging a bit you can enjoy some amazing wines at a very reasonable price. With Guy Savoy and Robuchon still ahead of us, we opted to hold back some at Lotus. 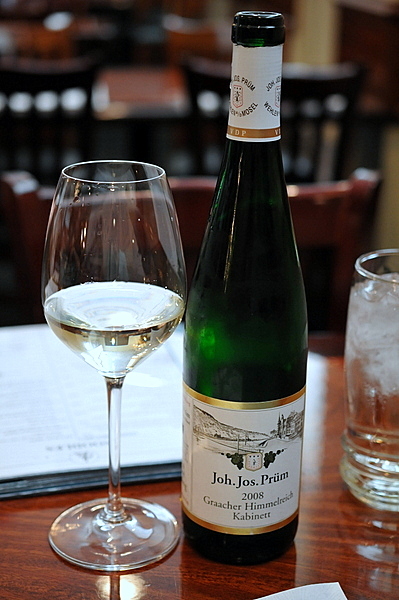 The JJ Prum was a prototypically vivacious Riesling, with aromas of stone fruit and mineral tinged with petrol-y funk. 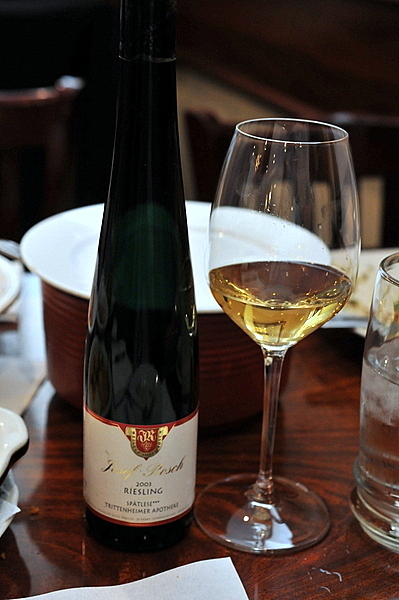 On the palate the wine has a sense of nervy acidity with a lingering floral sweetness. 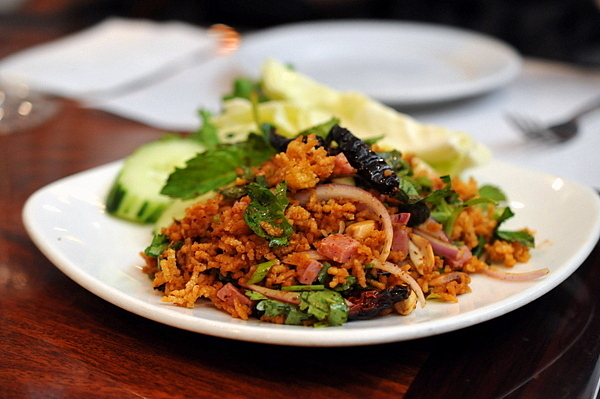 NAM KAO TOD - Crispy rice mixed with minced sour sausage, green onion, fresh chili, ginger, peanuts, and lime juice. 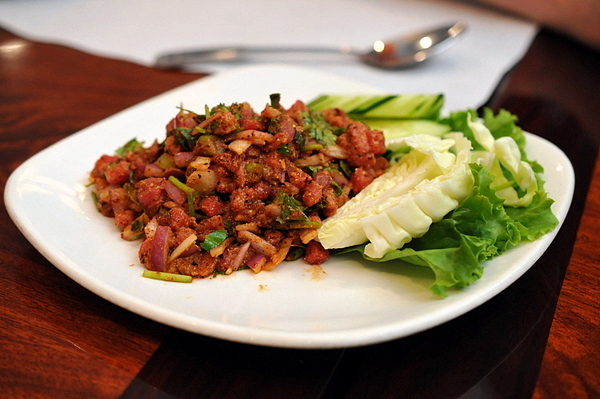 Originally a Laotian dish, the Nam Kao Tod is one of Chef Chutima's signatures and with good reason. The rice has a crunchy toasty savor that interleaved beautifully with the brash sour funk of the fermented sausage. The chili isn't readily apparent to start but after a few bites there was definitely a low slow burn. The raw cabbage provided a fantastically crisp and succulent counterpoint to temper the rice. KOI SOY (Steak Tartare - Issan Style) - Minced beef with fresh herb, fresh and dry chili, rice powder, seasoned sauce, lime juice, served raw. I'm a sucker for raw beef and this spicy rendition was a no brainer. The chunks of beef come covered in gritty dry chili, which adds roughness to the smooth supple texture of the beef. I ordered this at spice level 8 which I expected to be scorching, but instead the heat was palpable but not overwhelming. 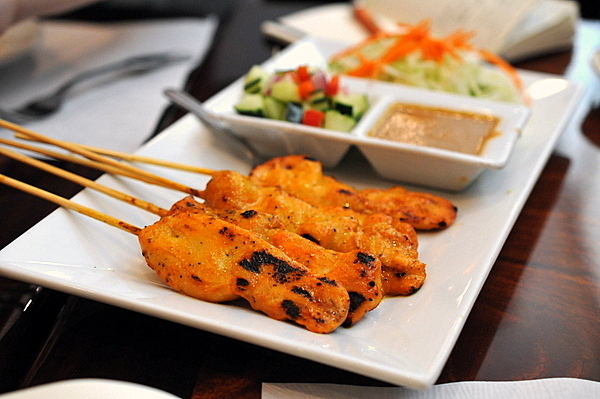 SA-TAY - Meat marinated with fresh herbs and spices, grilled on skewers, served with peanut sauce and cucumber salad. Never a huge fan of peanut sauce, I probably would have avoided this but one of my companions insisted. The skewers turned out to be fairly enjoyable, the most chicken bears a subtle char that was enjoyable enough even without the peanut sauce. The cucumber salad was on the sweet side but the moist crunch was a nice contrast to the chicken. Sai Oua (Northern Style Sausage) - If you like Louisiana style hot sausage you have got to try this one. 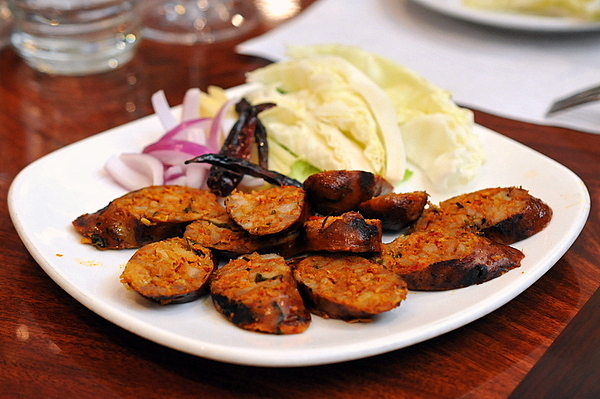 Stuffed with ground pork, fresh and dried herb and spice, this mild-medium spicy sausage is indeed very tasty. 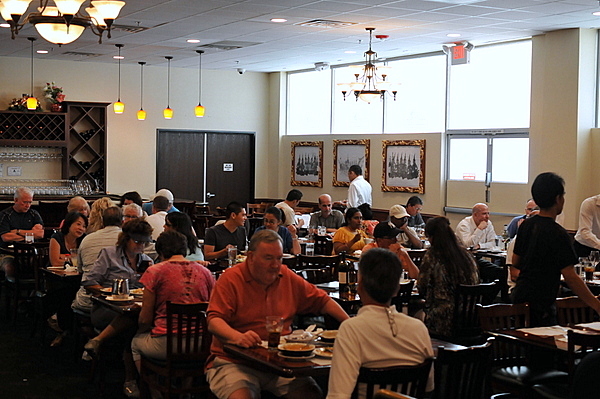 This was a recommendation from the staff at Renu Nakorn. The sausage is a mix of ground pork and chopped vegetables and though the description labeled this as "mild-medium" the Sai Qua sure packed a punch. Aside from the spice, the flavor was quite mild, making the onion and ginger absolutely vital. 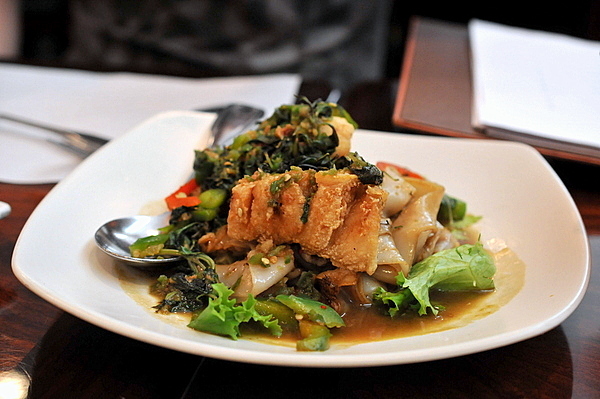 SEA BASS on DRUNKEN NOODLE - Deep fried Sea Bass topped with homemade fresh chili and Thai basil. Serve on the top of pan fried flat rice noodle. One of my friends recommended this dish after his visit. The bass was dense and meaty while the batter accentuated the fish's oily moisture. The pad kee mao was definitely the weak link, while the flavor was fairly prototypical the noodles were clumped together like they had been sitting out awhile. 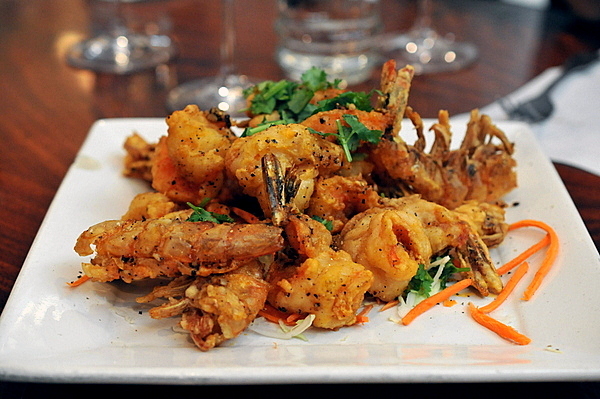 GARLIC PRAWN - Deep fried prawn with shell and sautéed with our special garlic sauce, topped with ground black pepper. Another recommendation from my friend the prawns certainly lived up to their name with loads of garlic-y savor. The meat was a touch tough but the shells were superb, fried to a brittle glassy sapor, it was like eating a gossamer shrimp chip. 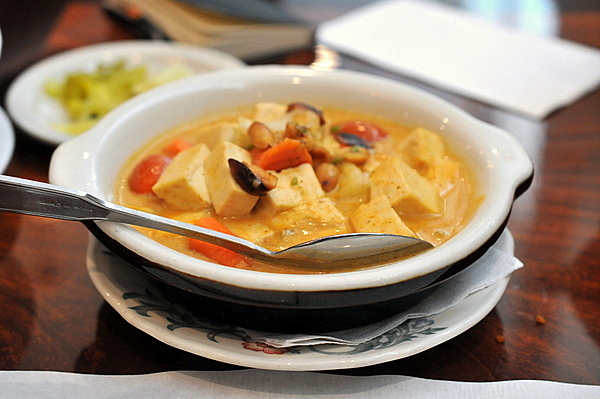 MUSAMAN CURRY - The very interesting flavor curry made from musman curry paste with coconut cream, peanuts, onion, tometo, poteto, carrot and your choice of meat or tofu. 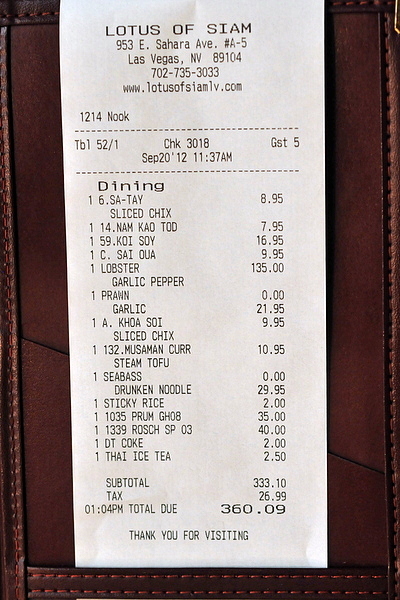 The same guy who ordered the satay opted to play it safe with his entree. The sauce has a rich sweet creaminess that worked well with the medium firm tofu. Like the satay the Musaman Curry was enjoyable enough but not particularly different from preparations at other good Thai restaurants. 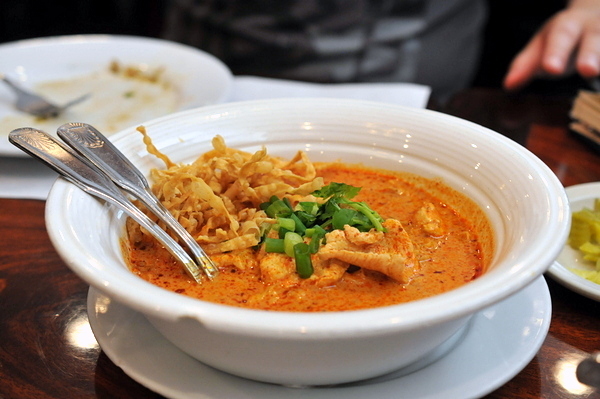 Khao Soi - This typical Burmese influence Northern Thai egg noodle is served in curry sauce and coconut cream (your choice of beef or chicken), garnished with sliced red onion, lime and pickled vegetables. Another recommendation from Renu Nakorn, that proved to be quite tasty. The plump supple noodles come covered in an unabashedly sweet coconut broth. Though a bit heavy on its own, the noodles went perfectly with the piquant crunch of the vegetables. The chicken was a touch overdone and completely unnecessary, but the rest of the dish was good enough that we finished the rest of the coconut curry with some steamed rice. We opted for a sweeter Riesling with some bottle age for our second wine. A bit subdued on the nose, the wine demonstrated a fuller riper flavor with more overt notes of honey. The rest of the party seemed to enjoy the wine but I thought it verged on overripe. 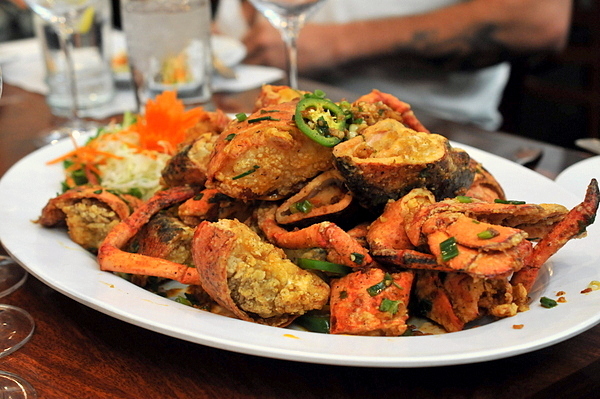 LOBSTER (Garlic Pepper Sauce) - Deep fried lobster, sautéed with our special garlic sauce. This gargantuan beast of a lobster not only surprised my party but also shocked a number of neighboring tables into silence. Easily the largest lobster that I've ever eaten, the flavor reminded me of the preparation I've had countless times at Chinese restaurants, though the larger lobster was noticeably tougher than the ones I normally eat. Lotus of Siam ended up being quite good and though I don't know if Lotus was the best Thai restaurant it certainly would have been my most expensive thanks to the lobster, but my companion Eric was kind enough to cover it. Ordering well is key, many of the 130+ menu items are readily available but Chef Chutima's specialty Northern Thai dishes are truly worth the trip. We go here every year with my wine buddies. 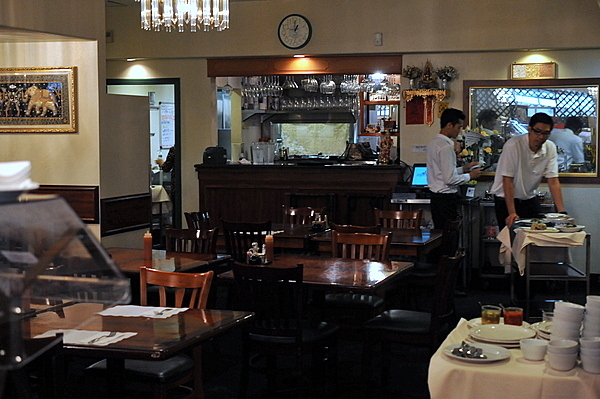 I think their curries are very hit and miss but their wine list is incredible if you know what to look for. A whole load of 76/71 Rieslings that were killer and also 06 rousseau chambertin for $350 was a steal! A good point about the wines, can't believe I forgot to mention their collection. In terms of food have you tried stuff of their Northern Thai Menu? $135 for the lobster, eh? It is hard to get a sense of scale in the photo, but I do hope it was gargantuan. Would you order it again? Unfortunately I realized as I was editing the photo that its hard tell, but yes it was a large lobster, I'd say 4lbs plus, though I've not had may lobsters of that size. I have. Other than the beef jerky (which I think is awful), the rest is pretty good.